Two years ago the government began collecting data on disabilities and employment as part of the U.S. Census. The information collected helped the Labor Department to create the first-ever report on the employment landscape for the 27 million working-age Americans with disabilities. Not surprisingly, the outlook is bleak, as reported in today’s Wall Street Journal. Most of us are pretty familiar with the numbers. In 2009, the average unemployment rate for disabled workers was 14.5%, vs. 9 % for those without disabilities. The study shows that people with disabilities are much more likely to be older, or work only part-time, than people without disabilities. (Read the full release here). The Labor Department’s report mirrors the 2010 Kessler Foundation and National Organization on Disability Survey on Americans with Disabilities that was released in July and timed to the 20th anniversary of the Americans with Disabilities Act, the civil rights law that is designed to increase employment by prohibiting discrimination in the workplace and calling for employers to provide the access and accommodations necessary to help workers with disabilities perform their jobs. (Read the USA Today article on the study). The Kessler/NOD survey found that many social and economic gaps still exist between the 54 million Americans with disabilities and those without, ranging from employment to education to access to health care and transportation. The survey says 21% of working-age people with disabilities say they are employed, compared to 59% of people without disabilities –- a gap of 38 percentage points. Still, the employment gap has been decreasing since 1998. But it’s good that we’re reporting this to the public. These numbers are often ignored by employers as they seek to build their workforce. Discrimination happens despite the ADA, and I’ve often said it’s because we have a broken hiring model. The hiring manager is tasked with finding the strongest candidate, which they do by weeding out weaker candidates. Without the right training and understanding, it’s too easy to dismiss a candidate who might have a limp, a hearing impairment, a loss of vision, or use wheelchair as being ‘weaker’ than someone without a disability. For the hiring manager to succeed in his job, he often ends up indirectly discriminating. Some companies are making strategic efforts to bring more disabled into the workplace. New York City based Lime has created a corporate partnership with Goldman Sachs, Pepsi, Google and others to select college students with disabilities as Lime fellows, with the goal of helping them get internships with these firms. The U.S. Business Leadership Network represents over 5,000 employers who have made a commitment to helping to hire more disabled workers. They include IBM, Merck, American Airlines, Shell, McDonald’s, Motorola, Starbucks (where I’m sitting right now, drinking a Venti iced Latte), Walmart, Walgreens, TecAccess, Wyndham Hotels, Disney, Marriott and more. (Check out the USBLN’s annual conference here). Now the piece de resistance, which I will type in caps so you won’t miss it. 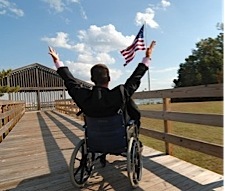 HIRING A WORKER WITH A DISABILITY YEILDS A SIGNIFICANT RETURN ON INVESTMENT. This is an untapped group that excels at adapting new technology, are creative problem solvers, and are far more likely to spend their working hours proving to an employer why they were the right hire in the first place. Don’t believe me? Check out this new brochure from Think Beyond the Label, a campaign to encourage small and medium sized businesses to hire people with disabilities: The Field Guide to Evolving Your Workforce. If you’re still not convinced, let’s chat at a Starbucks, McDonald’s or Marriott hotel convenient to you. I’ve linked to their diversity policies to give you a headstart.